Kampot is a third largest coastal province in Cambodia and best well-known for Kampot Pepper, one of the finest pepper in the world, this settle town offers many historical and natural wonders to discover. This province is located in the Southwest of the country with eighty kilometres coastal strip. It borders the provinces of Koh Kong and Kampong Speu to the north, Takeo to the east, Sihanouk Ville to the west and Kep as well as a long coastline on the Gulf of Thailand to the south. Compete to crowded Sihanouk Ville in the West of the province you may find quietness. Kampot town shows some of Indochina's best preserved colonial era shophouses creating a lovely old world feel. This small silence Kampot town is a common gateway to Preah Monivong Bokor National Park, the renowned whole-year round cool climate mountain and its self history. The stunning panoramic views from the mountain tops are greatly appreciated by visitors. Teuk Chhou Rapids and Prek Ampil Resort are within a short distance from each other and are the places beyond experience. Limestone caves, durian farms, pepper farms, salt farms and bird sanctuary are also worthwhile stops in Kampot. At the present, this coastal province is one among the potential eco-tourism provinces in Cambodia with its famous Bokor Mountain waiting for visitors to explore and experience. Kampot was one of Cambodia’s most important ports and trading centre until the establishment of a deep sea port at Sihanouk Ville in the 1950s. The legacy of French colonial administration is stronger there than in most other provincial towns. The riverside is lined with turn of the century buildings languishing in stately decay. Their strong, simple geometrical forms, high ceilings, hardwood floors, and mustard yellow walls symbolized both the simple orderliness and foreign grandeur of French administration. Beside the elegant French colonial buildings on top of Bokor Mountain many charming colonial-style buildings of all sizes along the riverfront streets of Kampot is a must visit. Though suffering a bit the ravages of time, the architecture of Kampot is pleasantly provincial, a mix of red tile-roofed shophouses and old French colonial government buildings. 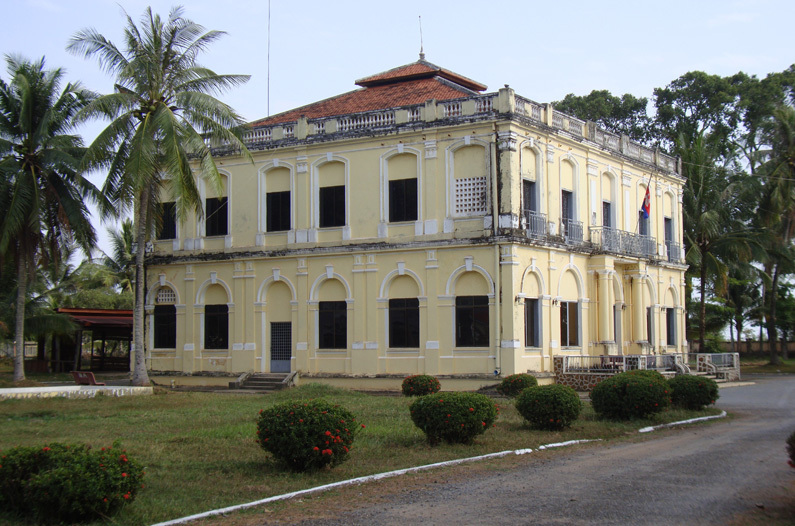 Kampot has been an active settlement for centuries but the location and layout of the modern town was established during the French colonial period in the late 19th and early 20th centuries. Many of the buildings along and near the river were constructed during this period. The south end of town harbors several European-style buildings including the governor‘s mansion and the old prison. Most of the other colonial era buildings employ the classic 2-sotrey “Chinese shop house” design, many displaying European design elements. Kampot is renowned for its excellent pepper which has more than a century long history and is one of the highest quality peppers in the world. The fresh climate and soil type of Kampot as well as the experience from several generations of pepper farmers make this pepper unique and much sought-after by gourmets worldwide. The specificities of the Kampot pepper come from the mildness of their spice, the freshness and complexity of their aromas and their exceptional lingering taste. Despite pepper cultivation being adversely affected by events in Cambodia’s recent history, small farmers in the region are using their traditional skills and knowledge to once again make Kampot pepper a valuable product. Best time to visit pepper farms is the time before the harvest in March until April. If you travel from Phnom Penh to Kampot, you will be greeted with a giant statue of a durian. It is no coincidence as the province is supposed to grow the most delicious durians anywhere in the region. Like other potential provinces, beside durian, Kampot produces many preferred seasonal fruits such as coconut, mango, rambutan, and mangosteen. Durian and coconut are the main agriculture products in Kampot providing almost all around in Phnom Penh. Series of caves near Kampot town are limestone caves, some dated back to pre-Angkorian era. Some limestone formations are in the shapes of elephants. Also, various brick structures amongst the stalagmites and stalactites are formed within the caves. There are Buddhist shrines and huge rocks balanced in a hole on the ceiling of the caves. The most popular caves are the caves of Phnom Chhnork, the cave at Phnom Sla Ta'aun, the cave at Phnom Sasear and the caves at Phnom Kampong Trach. The caves of Phnom Slap Ta’aun are very accessible, lying only about 8 kilometres from Kampot town. The cave at Phnom Sasear is better known as the White Elephant Cave. The stairs up the side of the outcropping provide a beautiful view of the countryside, especially during the wet season. Kampong Trach is renowned for caves with their ancient ruins. Kampot beaches feature sandy beach with thousands of mangrove and coconut trees growing nearby, making the site ideal for visitors looking for a pleasant place to relax. Kampot Sea is typically good for snorkeling and scuba diving. The islands in Kampot are still in an unspoiled state.